This used to be like my favorite place to be all the time. I should really be more active here. Who remembers that TCF nightclub RP a while back? Jill and Volkomaus Znustoba like this. Eh... that thing would need some re-working so it wouldn't just get boring after a while and die again. Pokemon Go now blocks players with rooted phones. Honestly I was really excited for the whole Buddy update and stuff. And then this? So... if you were a Pokemon, would you be a ground type because of your affinity for mud? Does this mean I'd be a mechanical type? You? Uhh... Normal/Psychic. There's a Steel type but I don't think that'd apply to you anymore... for reasons you should know. My birthday's coming up! September 22! Myu, Supreme Overlord Shadere, Krasunir and 4 others like this. I have a friend who has his birthday on September 22nd. Now I have two friends who have their birthdays on September 22nd. PlanteraBlade, Myu, MournfulRelic and 3 others like this. Does rooting your phone to replace the main font files count as hacking? I would consider it modifying, but I don't really know lol. For some reason, the forums are doing this weird glitch thing unless I'm using Incognito. D'oh, Chrome, I guess. I'm really not sure, I don't use Chrome or mobile for the site. Yeah, it's an extremely weird glitch, I don't think I can find any explanation to it. Hopefully it's one of those things that'll just fix itself eventually. I'm afraid https is my only choice currently. Incognito would work but the log in with steam is uncooperative with that. Everyone's changing to funny names. Should I do one? It's like, I'd rather just make an extra joke account but I'm pretty sure that's against the rules. Funny names are cool and wacky! But the fact that it's so terrible is why I love firing it from a Sandgun! SilverBird, PlanteraBlade, Volkomaus Znustoba and 2 others like this. 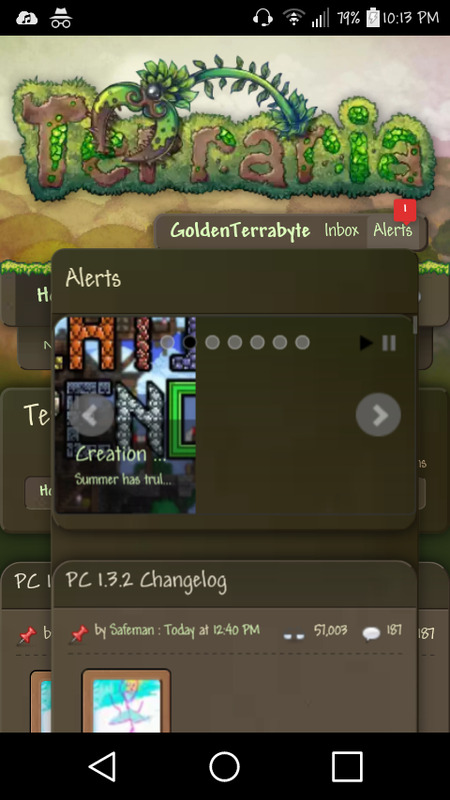 terraria go would be awesome. Anyone else constantly getting logged out whenever they try to do something? Happened earlier today (12 hours ago) while I was checking alert. Refresh the page and it became fine. It sounds like it may be the https issue. Trying to use the https connection to this site causes users to logout as a bug that's been on this site for a long time. It can be fixed by ensuring your connection is http. If you're using a browser add-on that forces https connections, then try disabling it for this site. Always money in the banana stand.